The touch probe is a metrology add on to the ATOS measurement systems that provides precise 3D co-ordinate points for difficult to access areas, hidden cavities and discreet points. The probe consists of a calibrated set of point markers that are optically tracked by ATOS 3D measurement digitizers, describing an object’s surface precisely with online 3D co-ordinates of the touch probe. There are 5 standard touch probe sizes to cater for a variety of object dimensions, ranging from full scale aircrafts to small plastic parts. The user also has the option of customizable touch probes for specific tasks. 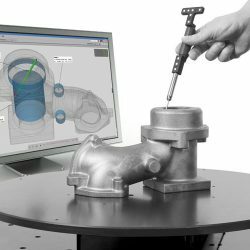 The lightweight GOM Touch Probe allows measurement without internal electronics or cables and can provide highly stable 3D points in combination with a 3D scanning system. Optically inaccessible areas are easily measured using the tactile measurements of a touch probe. 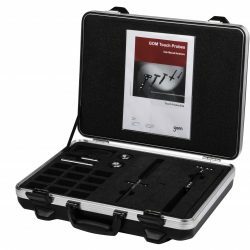 The GOM adapters provide further possibilities for online measurement, such as adjustment of components and fixtures, as well as determination of trimming and spring back. 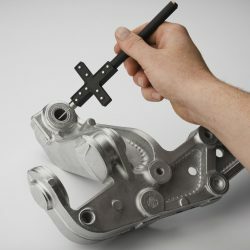 Fast online measurement of primitives and edges are also possible with specific adapters, with adapters being customizable to fit any geometric form.